Neuquén contrasts sharply with the aridity of the mountainous northern region. 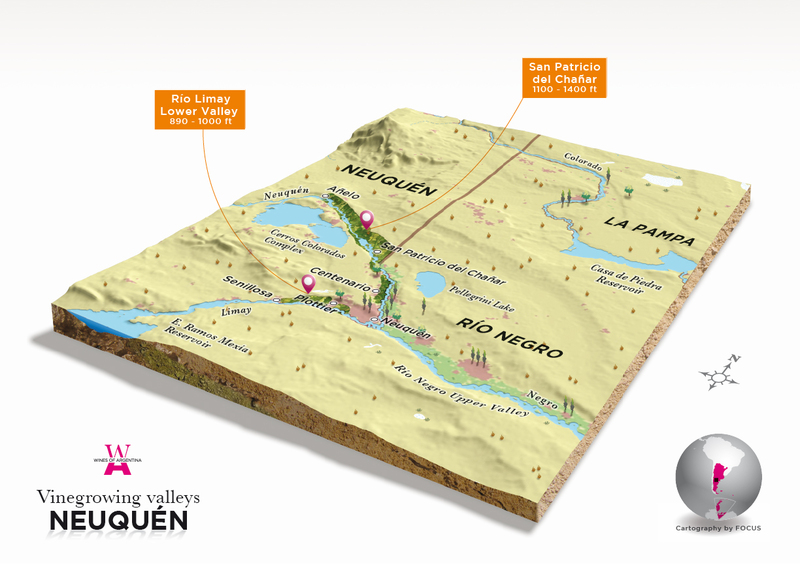 San Patricio del Chañar, 37 miles to the northwest of the province's capital, has been chosen by the largest winegrowing establishments. In the last few years, more than 3,460 acres have been planted with vineyards and five wineries have been built. The region receives 7 inches rainfall and has temperature ranges exceeding 68° F difference between day and night during the ripening period. The climate is ideal for the development of winegrowing. Vineyards stand at 1,300 feet above sea level. All these features come together to ensure extremely healthy grapes with great concentration of colors and aromas, slowly developing tannins and perfect levels of acidity, which will then yield high quality wines. The wines of the region display remarkable color concentration, intensely fruity aromas, and great body and structure in all their varieties. The cooler climate leads to more elegant red wines, such as the great Pinot Noir.